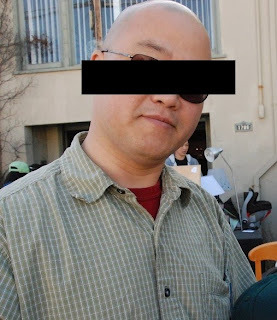 A particular man in our midst, who will remain anonymous (the identity of this man is to remain strictly confidential, as evidenced by the effort put into protecting his identity in the photo), walked into Berkel Berkel, which is a Korean restaurant on Telegraph Ave. in Berkeley. "Ummm... should you be ordering this? I'm not sure if I feel okay about selling meat to a..."
Brother D quickly realized what was happening and said, "Oh, I'm not a monk." The owner's eyes widened, and he tried to quickly recover, "Oh... is that so? Wow, I just thought that since your face looked so peaceful, you must have been... Well, then, enjoy." I'm not really sure about the owner's logic... First of all, if your Buddhist convictions are bothered by someone eating meat, why are you selling meat in the first place? Second, I highly doubt that the owner made his judgment by looking at how peaceful this particular brother's face looked. Haha...I love the efforts that were put into protecting this "anonymous" brother. I wonder if Brother G would get the same reaction...but I somehow doubt it. what duh.. he isn't a monk?